The Fall of Jerusalem and the End of the Old Covenant Age — How Was that Good News? Those who accept the Biblical testimony that Christ came in the first century, at the end of the Old Covenant age are often accused of not preaching the Gospel. We are told that we ride a hobby horse. We are accused of preaching a gospel that has no hope. Sam Frost recently stated on Facebook, in one of his many attacks on Covenant Eschatology, that nothing could be worse than believing a system or doctrine that has no hope– an on-going, unfulfilled hope of the supposed end of time! Preterists say that all promises and prophecies are fulfilled, thus, preterists are preaching a “hopeless” gospel, and that is horrible, says Mr. Frost. Based on this “logic” if it can be called that, when all prophecy is finally fulfilled, and there is no longer any “hope” Christians will be living in a horrible world – the world of fulfillment! How terrible! Mr. Frost is purposefully ignoring Proverbs 12:17, (He knows the text well) – “Hope deferred makes the heart sick. A promise fulfilled is a tree of life.” But evidently, Mr. Frost prefers “hope” to the tree of life! Millennial author Joel Richardson stated in a recent Twitter discussion – “Full preterism fails to meet the basic criteria of actually being ‘good news.’” (Twitter feed 5-15-18). In that Twitter exchange, when I invited Mr. Richardson to engage me in formal debate, his response was to accuse me of arrogance, condescension and dishonesty! He then accused me and other preterists of denying that Christ “is human in any way.” When I asked him to prove his (slanderous) claim by citing any preterists who believes that, he blocked me from his Twitter feed. He subsequently blocked other preterists for asking for documentation of his claims. For those interested, as I write this I am in the process of producing a YouTube series reviewing and responding to Mr. Richardson’s book, Mystery Babylon: Unraveling the Bible’s Greatest Mystery. You can watch the first video in that series here. Mr. Richardson’s book is rife with theological error, exegetical failings, anachronistic assumptions and logical fallacies. Let’s allow the Bible – and Jesus himself – to answer these questions, by looking at Matthew 23-24. In chapter 23:37, Jesus, standing in the temple, had pronounced coming judgment on that holy place: “Your house is left to you desolate.” This the context for the beginning of chapter 24 where the disciples begin to show Jesus the stones of the temple. The beauty of that temple must have been astounding! It is commonly believed, in fact, the majority opinion among commentators is that the disciples were confused and wrongly believed that the temple would not – indeed, could not– be destroyed until the so-called “end of time.” John Calvin went so far as to say: that the disciples, “did not suppose that while the building of this world stood, the temple could fall to ruins.” The disciples were therefore mistaken in their questions. (John Calvin, Calvin’s Commentaries, (Grand Rapids; Baker, XVII, 2005), 117). How in the name of reason could Jesus call that horrific catastrophe the “good news” i.e. the gospel, and then, how could he call it “this gospel, this good news, of the kingdom”? How is the destruction of the Old Covenant City, Temple and people, “this gospel of the kingdom“? And, how was it related to the kingdom? There are many reasons why that event was “good news,” but lamentably, these reasons are commonly overlooked (or ignored) by all but a few commentators through the ages. So, how could Jesus call that message of coming disaster “good news”? There are numerous reasons, and this is the first in a series of articles exploring some of those reasons. ★ It was good news for Jesus’ followers because the destruction of Jerusalem would mean relief from the organized persecution of the church by the Jewish authorities. “Therefore you are witnesses against yourselves that you are sons of those who murdered the prophets. Fill up, then, the measure of your fathers’ guilt. Serpents, brood of vipers! How can you escape the condemnation of hell? Therefore, indeed, I send you prophets, wise men, and scribes: some of them you will kill and crucify, and some of them you will scourge in your synagogues and persecute from city to city, that on you may come all the righteous blood shed on the earth, from the blood of righteous Abel to the blood of Zechariah, son of Berechiah, whom you murdered between the temple and the altar. Assuredly, I say to you, all these things will come upon this generation” (Matthew 23:31-36). So, Jerusalem would be the epicenter and the source of the organized persecution of Christ’s followers– “it is not possible that a prophet perish outside of Jerusalem” (Luke 13:33). “For other nations have not inflicted on us and on Christ this wrong to such an extent as you have, who in very deed are the authors of the wicked prejudice against the Just One, and us who hold by Him. For after that you had crucified Him, the only blameless and righteous Man,-through whose swipes those who approach the Father by Him are healed,-when you knew that He had risen from the dead and ascended to heaven, as the prophets foretold He would, you not only did not repent of the wickedness which you had committed, but at that time you selected and sent out from Jerusalem chosen men through all the land to tell that the godless heresy of the Christians had sprung up, and to publish those things which all they who knew us not speak against us. So that you are the cause not only of your own unrighteousness, but in fact of that of all other men.” (Against Trypho, Chapter XVII). Notice that what Justin accused the Jews of doing is precisely what Jesus foretold: “At that time you selected and sent out from Jerusalem chosen men through all the land to tell that the godless heresy of the Christians had sprung up, and to publish those things which all they who knew us not speak against us. So that you are the cause not only of your own unrighteousness, but in fact of that of all other men.” Justin is clearly referring to Jesus’ generation and the actions of the Jewish leaders of that time, because Jerusalem had been destroyed by the time he wrote. “Unless the evidence is misleading, they instigated the Neronic outburst against Christians; and as a rule, whenever bloody persecutions were afoot in later days, the Jews are either in the background or the foreground.” (Adolph Harnack, Mission and Expansion of Christianity, Harper and Brothers, 1961), 57+). N. T. Wright observes: “Persecution of Christians did not in fact, initially come from pagans.” He continues, “In fact, the earliest and best evidence we possess for serious and open hostility between Jews–especially Pharisees–and the nascent Christian movement is found in the earliest period for which we have evidence, namely in the letters of Paul. He, by his own admission, had persecuted the very early church with violence and zeal.” (N. T. Wright, Jesus and the Victory of God, (Grand Rapids; Eerdmans, 1996), 374). Thus, when Jesus, in Matthew 23-24, predicted the coming destruction of Jerusalem, he was essentially predicting the end of the organized, centralized Jewish persecution of the church. We find this promise throughout the NT epistles, the coming judgment of the persecutors of the early church. This is found in Romans, in Galatians, in Thessalonians, in Hebrews, in James, in Peter and in Revelation! This is a dominant theme and motif in the NT! As we continue in this series, I will share some of the attendant, additional elements of “good news” that would accompany that prediction of Israel’s impending judgment. For now, it is enough to realize that when Jesus predicted the coming destruction of Jerusalem, to his disciples who would be chased “from city to city” by those sent out by the leaders of Jerusalem to kill them, that truly would have been “good news.” How could it be anything else? More to come! 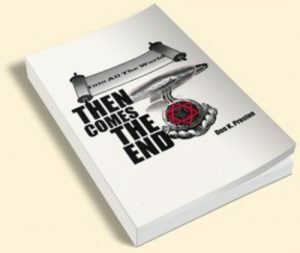 In the meantime, get a copy of my book, Into All The World, Then Comes The End, in which I demonstrate with abundant evidence, both scriptural and historical, that the Jewish persecution of the first century saints is a key eschatological tenet and inextricably bound up with the Day of the Lord and the resurrection. This book proves that the time of the end was in the first century– and it was good news! Previous Previous post: Mystery Babylon? Exposing Joel Richardson!